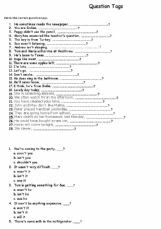 Fifty simple sentences to practice question tags. 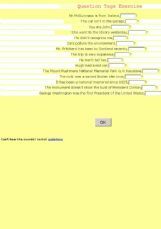 It is an exercise for the students who begin to learng question-tag. 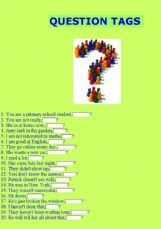 It may be useful while practising Tag Questions. 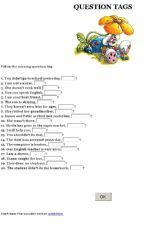 Students must choose the correct answers referring to tag questions. Based on a movie-world context, this exercise aims at practicing question tags and their answers. Well illustrated and really worth trying!